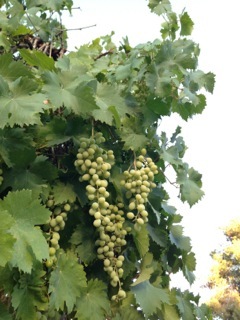 I’ve already put up some grape leaves for future dolmathes. And the caper project (or as Ellen dubbed it, The Caper Caper) is winding down just as the sumac and grapes are ripening. Figs ready soon. 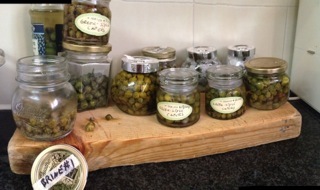 We’ve got a decent number of jars of capers put up, but I doubt it will be enough to get us all the way through till their season next year. We keep finding more uses for them, and also we keep proudly giving them to friends and family. Speaking of family, many visitors are showing up at the end of the month for the wedding of bf’s younger son, and I’m stocking up on foraged treats to share with them. Besides the capers, I’ve got a few bottles of elderflower champagne, some naturally fizzy fermented ginger ale, and now that the sumac is coloring up I’m going to make plenty of sumac “juice” to have on hand for both alcoholic and non-alcoholic drinks. 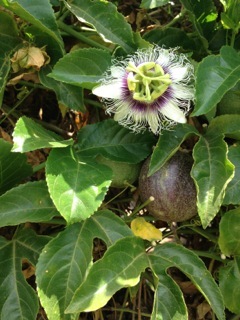 Passionfruit is ripening as well, and I’ve been stockpiling the juice in the freezer. Stay tuned for a post on the easiest way to free the juice from the many seeds, and what to do with passionfruit juice once you’ve got it. I’ve also been foraging Saint John’s Wort. The yellow flowers turn oil a stunning crimson. I use the oil externally for nerve pain such as sciatica, or that old knee surgery scar that still bothers me. In a month, I’ll be back in New York where I’ll hit the ground running with a busy schedule that includes foraging tours, botanical classes, and book events. If you haven’t already gotten your copy of Northeast Foraging: 120 Wild and Flavorful Edibles from Beach Plums to Wineberries, you can get one from me in person if you’ll be in the NYC area after mid-August. Or maybe we can meet up at the Midwest Harvest Festival in September. …and drumroll, please: Preserving Everything: Can, Culture, Pickle, Freeze, Ferment, Dehydrate, Salt, Smoke, and Store Fruits, Vegetables, Meat, Milk, and More will be released on August 4th (Kindle version on September 5th). Apparently Amazon pays attention to pre-order numbers as far as how prominently they promote a book, so if you’re thinking of getting it please go ahead and pre-order, and thanks! Or you can get one from me in person at this Slow Food NYC event. P.S. – For those of you who’ve been concerned about the fact that I’m in Israel with all that’s going on, thank you for your concern. This is my sustainable food systems blog primarily focused on foraging and food preservation (although I leave myself wiggle room to share great local food ideas that don’t fit into those categories). I have decided to leave politics out of it, so this is all I’m going to say about that. Can’t wait to read the new book!